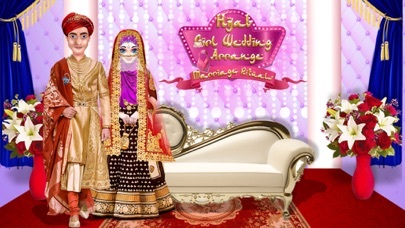 Hijab Wedding Girl Arrange Marriage game is basically Indian wedding games, where you found hijab girl marriage rituals. Wedding is an integral part of Islamic culture. This Wedding traditions vary greatly based on countries and regions, but at its heart, the ‘Nikah’ ceremony remains the same. In India, there are many people follow traditional Islamic wedding rituals which are a unique blend of traditional customs as well as adapting the pre-existing rituals of the multi-cultural Indian sub-continent. Let’s take a look at the various rituals of a Wedding in this game and makeover games for girls. Pre-wedding Rituals are: -Salatul Ishtikara - Imam Zamin - Mangni known as Engagement - Manjha known as Haldi rasam - Mehendi known as henna paste - Sanchaq Wedding Attires are: -Groom Dressup - Bride Dressup Wedding day Rituals are: -Baraat - Nikah - Arsi Mushraf Post-wedding Rituals are: -Rukhsat - Walimah - Chauthi It is a muslim hijab fashion dress up for wedding and provide muslim hijab fashion doll makeover and muslim hijab fashion stylist salon with new fashion trends, muslim hijab culture with unique customs & traditions. Make up and Dress up with your dream hijab fashion doll! Dress up your hijab fashion model with variety of fashion items, mix & match hijabs, burkhas & mehndi. Hijab Doll fashion makeover, a royal muslim girl is getting ready for her marriage. 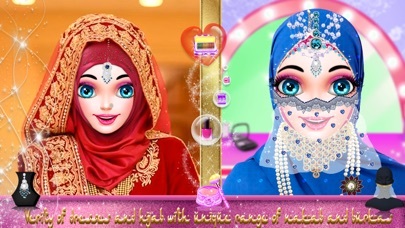 Muslim Hijab Doll Fashion Salon Wedding Makeup Games is fully in Hijab theme. In this game Hijab Hand Art is a superb view for Mehndi Game, set your favourite hijab styles Mehndi design. Girls are all ready to go to this amazing new event and want to look fabulous. Let’s help her with their makeover and clothes for the real muslim wedding in a style of hijab fashion bountique. Give a relaxing treatments to girl in make up salon and spa, before make her ready for marriage. Let’s your dream comes true as a hijab fashion designer on this fashion doll game. it is for Muslim women make up a character with a variety of Hijab where make your doll more beautiful than mermaids. Wearing a hijab can be tough, but in girl makeup salon it is quit easy so you can enjoy it with fun. 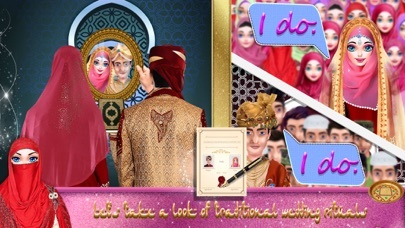 These is a hijab dressup & wedding makeup - fashion salon game. 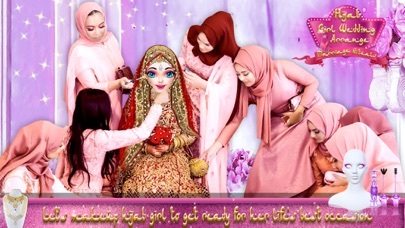 Here, you can do full wedding preparation with simulation to look girl more beautiful in hijab fashion doll makeup salon for a special day of her life. And also in this game we are providing special hijab facial spa to look gorgeous. Every Girl wants to look beauty and Fashionable so we are providing a huge collection for hijab beauty princess makeover and hijab artist. So you can say that it is a hijab style makeup salon game. In this salon game,we also provide a deep look and groom fashion so that groom also look handsome on a special day with royal indian wedding rituals and makeover. And cultural muslim marriage, muslim for marriage, hijab in islam, islamic hijab, hijab dress, arrange, muslima marriage, hijab dress up, indian wedding, muslim 4 marriage Hijab culture is different by region so we can say that hijab makeover is for multi country girls like, african, turkish, indian, etc. 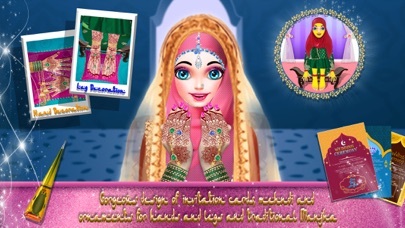 Features: - Muslim wedding games - Wedding games - Indian Mehndi Designs - Muslim Hijab Fashion Doll - Indian Wedding Girl - hijab muslim dress up games - muslim hijab makeover game - Hijab Makeup Salon Game - Hijab fashion doll dressup games - Muslim Indian Stylist Salon - Muslim Hijab Indian Saree Fashion - Indian Henna - Indian Mehndi Designs - Wedding makeup games - Hijab girl makeover - pink princess wedding salon - Indian Wedding Salon - Indian Stylist Salon - Indian Saree Dressup Games - Indian Nail Spa - Indian Nail Art Salon - Muslim Indian Stylist Salon - Muslim Hijab Indian Saree Fashion Hope you enjoyed playing our hijab games and if you want more features for this game please leave a comment.